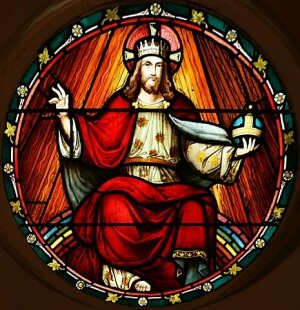 Today is Christ the King Sunday, the last Sunday in the Christian year (or church year or liturgical year). Psalm 21 speaks clearly into our celebration of Christ the King. Originally, this poem was a psalm of David that celebrated the victory or the coronation of an earthly king (perhaps David himself). Speaking to the Lord, David says, “For you meet him with rich blessings; you set a crown of fine gold on his head” (21:3). In this image of the crowning of the King of Israel, we see something of the future. We catch a glimpse of the day when Christ will be crowned as King of all creation, when every creature in heaven and on earth will bow before him (Phil 2:9-11). In that day, God’s peace will fill the earth. The wolf and the lamb will dwell together in harmony (Isa 11:6). Wars will cease and weapons of war will be turned into tools for farming (Isa 2:4). God’s justice will prevail throughout the world (Isa 42:4). We aren’t there yet, are we? Yet, in anticipation of what is to come, and in recognition of the fact that Christ is King even today, we celebrate him and his reign. We do this with songs and prayers. And we do this by offering ourselves as his servants, living for him, not just today, but each and every day. In what ways do you experience Christ as King? How might the fact that Christ is King change the way you live each day? What aspects of the future kingdom do you long for today? “Crown Him with Many Crowns,” by Matthew Bridges and Godfrey Thring, public domain. Image Credit: “StJohnsAshfield StainedGlass King” by Toby Hudson – Own work. Licensed under CC BY-SA 3.0 via Wikimedia Commons.